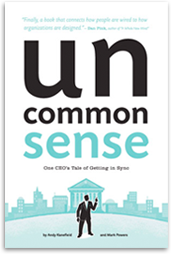 WHAT DOES DAN PINK, AUTHOR OF DRIVE AND A WHOLE NEW MIND, SAY ABOUT UNCOMMON SENSE? CLICK HERE to preview the pages and buy your own copy of Uncommon Sense on Amazon.com. Or sign up for our updates below and get a free ebook version of Uncommon Sense!